Spleen. Light micrograph of a cross section through the spleen. The spleen has a dense, fibrous, outer capsule (top right corner). 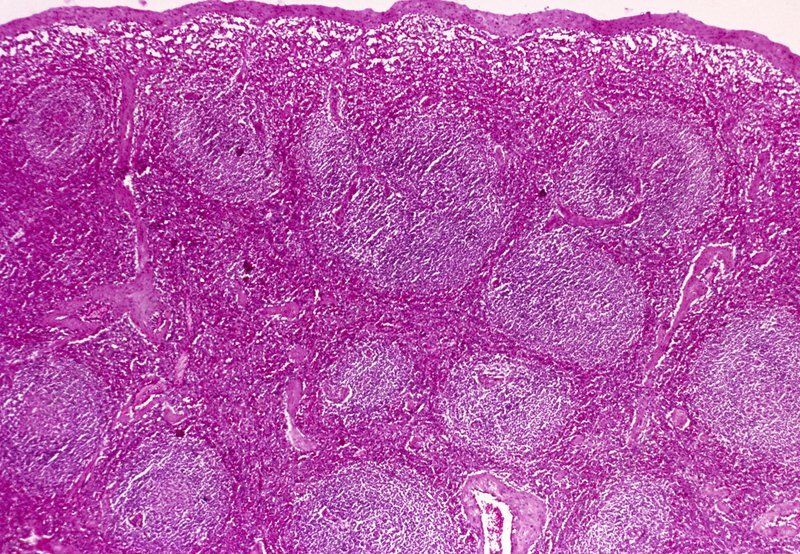 The spleen consists of nodules of white pulp (purple) which contain populations of lymphocyte cells. These initiate immune responses against diseases. The white pulp is embedded in red pulp (pink) made largely of red blood cells. Trabeculae as seen at bottom centre contain arteries and veins. The spleen's roles include removal of disease- producing organisms from the blood, production of immune responses and destruction of old or defective blood cells. Haematoxylin and eosin stained.